Front and back decorated high quality orphreys. The green chasuble is the fourth one of the same design that I purchased. The same excellent work. Well done! An excellent vestment. Highly recommanded. An excellent roman chasuble. Best value for money.Highly recommended. I bought this vestment in red two years ago in honour of St. Matthias the Apostle, and only use it on Feasts of the Apostles. The red is just beautiful and reminds me of the blood of the martyrs. 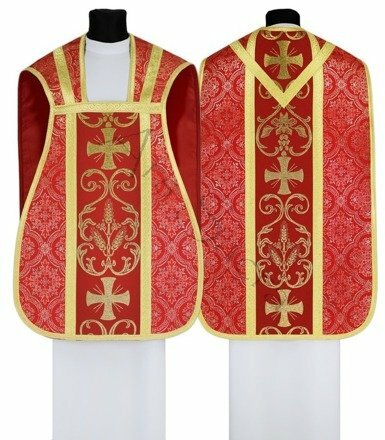 I recommend this chasuble to all who are thinking of buying it. The only thing is though, that the burse could be about 5 cm bigger. For this price, this is a great product. I think requesting a gold lining for the cream one would make it even more beautiful. I love the burse and chalice veil too. Nice product and highly recommended.